Top officials of the United States and China met in Washington Friday to discuss their bilateral relationship and efforts to rid North Korea of its nuclear weapons. In a press conference following the talks, U.S. Secretary of State Mike Pompeo said he urged China‘s cooperation on sanctions enforcement to help achieve the denuclearization of North Korea. “I expressed in our meeting today the importance of remaining united in pursuit of a final, fully-verified denuclearization of North Korea as agreed to by Chairman Kim in Singapore,” he said, referring to the historic summit between U.S. President Donald Trump and North Korean leader Kim Jong-un in June. The U.S. and China have been at odds over sanctions policy, with Washington insisting that the sanctions remain on until North Korea fully dismantles its nuclear program and Beijing calling for a gradual easing of sanctions in return for Pyongyang‘s disarmament steps. 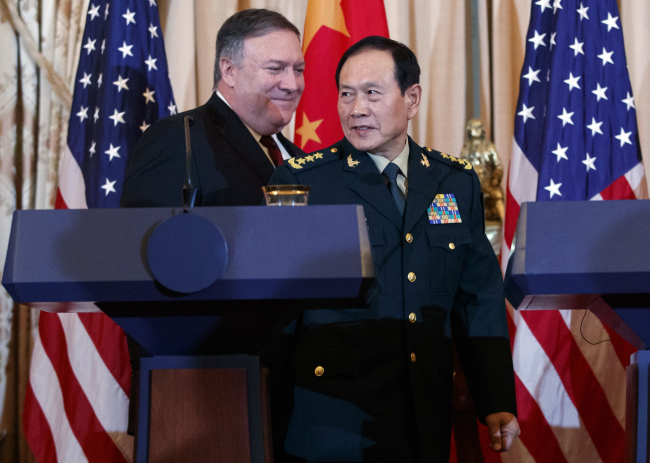 Speaking alongside Pompeo, Yang Jiechi, director of the Chinese Communist Party’s Office of Foreign Affairs, said the two sides held “in-depth” talks on the Korean Peninsula. “China reaffirmed its position and commitment to denuclearization of the Korean Peninsula, peace and stability of the Korean Peninsula, and a solution through conversation and negotiation,” he said. On the sanctions, he said China will “continue to enforce strictly” the relevant U.N. Security Council resolutions. His remarks come after a scheduled Thursday meeting between Pompeo and a top North Korean official in New York was postponed at the last minute due to what the U.S. said were scheduling issues. The sudden cancellation raised speculation that the North canceled the meeting in anger over the U.S.’s refusal to lift sanctions until after the full denuclearization of the regime.